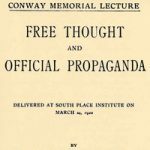 Delivered as a speech as part of Conway Memorial Lectures at South Place Institute on 24 March 1922. This essay by Bertrand Russell a British philosopher, logician, essayist and social critic is very relevant even today. In this essay/speech Russel talks about the challenges for free-thought and free-speech in the context of raising nationalism and industrialism. He identifies three major causes for the decline of free-thought, format of our education, Propaganda and Economic pressure. All true even today whether it is America, Europe or India. It’s an interesting reading with great quotes if you have a couple of hours. It’s a forty page or so small booklet available on Gutenberg for free. Some of my favorite quotes are below. Enjoy. It is clear that the most elementary condition, if thought is to be free, is the absence of legal penalties for the expression of opinions. No great country has yet reached to this level, although most of them think they have. The opinions which are still persecuted strike the majority as so monstrous and immoral that the general principle of toleration cannot be held to apply to them. Legal penalties are, however, in the modern world, the least of the obstacles to freedom of thoughts. The two great obstacles are economic penalties and distortion of evidence. believe there are still some people who think that a democratic State is scarcely distinguishable from the people. This, however, is a delusion. The State is a collection of officials, different for different purposes, drawing comfortable incomes so long as the status quo is preserved. The only alteration they are likely to desire in the status quo is an increase of bureaucracy and of the power of bureaucrats. It is, therefore, natural that they should take advantage of such opportunities as war excitement to acquire inquisitorial powers over their employees, involving the right to inflict starvation upon any subordinate who opposes them. In matters of the mind, such as education, this state of affairs is fatal. It puts an end to all possibility of progress or freedom or intellectual initiative. Yet it is the natural result of allowing the whole of elementary education to fall under the sway of a single organization. Education should have two objects: first, to give definite knowledge—reading and writing, languages and mathematics, and so on; secondly, to create those mental habits which will enable people to acquire knowledge and form sound judgments for themselves. The first of these we may call information, the second intelligence. The utility of information is admitted practically as well as theoretically; without a literate population a modern State is impossible. But the utility of intelligence is admitted only theoretically, not practically; it is not desired that ordinary people should think for themselves, because it is felt that people who think for themselves are awkward to manage and cause administrative difficulties. Only the guardians, in Plato’s language, are to think; the rest are to obey, or to follow leaders like a herd of sheep. This doctrine, often unconsciously, has survived the introduction of political democracy, and has radically vitiated all national systems of education. Propaganda, conducted by the means which advertisers have found successful, is now one of the recognized methods of government in all advanced countries, and is especially the method by which democratic opinion is created. It must, I think, be admitted that the evils of the world are due to moral defects quite as much as to lack of intelligence. But the human race has not hitherto discovered any method of eradicating moral defects; preaching and exhortation only add hypocrisy to the previous list of vices. Intelligence, on the contrary, is easily improved by methods known to every competent educator. Therefore, until some method of teaching virtue has been discovered, progress will have to be sought by improvement of intelligence rather than of morals.